Sometimes I feel like an emotional wreck. I don’t know how to express myself so, frustrated, I end up in a heap, dejected, rejected, bereft, if not by anyone else, at least by common reason, or rationality. Isolated, even abandoned, inarticulate and mute, feeling unloved and lonely. A self-indulgent deluge of descriptors plagues me. There are often unexpected parallels in daily experience. 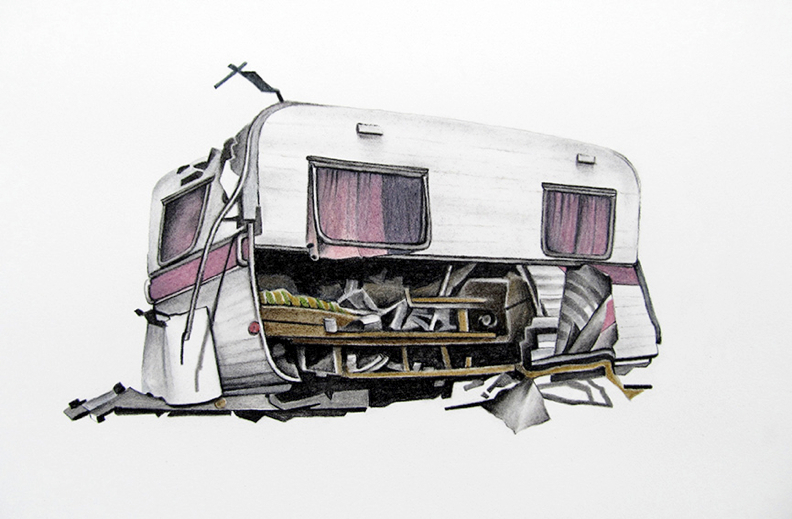 I am writing a response to an exhibition of artwork that I encountered a few days ago when I could see the beauty and pathos encompassed in the metaphor of Stefan Gevers’s renderings of derelict caravans. But today I suddenly relate to them in a much more immediate and personal way. There is a tension in the work where the composition depicts a precarious position, a weighted possibility that is a snapshot of a situation. Will it (the caravan) tumble and slide further into decrepitude, or just teeter there for that little bit longer—a stasis—this way, that way, never knowing which. 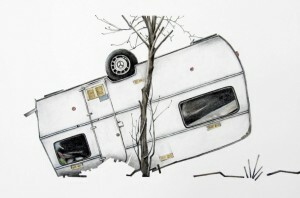 These images are executed lovingly with care and precision, muted colours, fading with nostalgia; some are watercolours. But it’s the use of coloured pencil and charcoal which softly shades the paper giving shape to the sagging forms that I like most. Gevers depicts a figurative death in an almost nondescript yet desolate landscape that verges on the romantic. It could be a wrecking yard in Fairfield, rural backwater or the middle of the desert. The ravaged curtains, broken glass and rusting tin evoke the melancholy spectre of a beauty born of neglect. 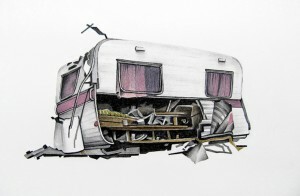 Here we see the remains, the cadaver, the corpse of a broken heart, or quite literally a broken home. 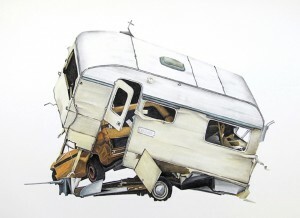 Stefan Gevers, Secondhand serenade, Stockroom, Kyneton, Victoria, 8 September – 7 October 2012.